I wanted to share a 2010 document A FOCUS ON ENGLISH LANGUAGE LEARNERS (ELLs) AND THEIR ACADEMIC ACHIEVEMENT: A POSITION STATEMENT 2RTI FINAL [5_5_10v2] on considerations of using RTI in bilingual language programs. The position papers summarizes why a 2RTI Model is better than a regular RTI model in bilingual language programs. It also speaks to the importance of language learning and how the 2RTI can serve as a framework for planning and developing of you program. These post is a link to a live chat for Understood.Org, a division of the National Center for Learning Disabilities. Understood.org is a website for parents who have questions about their children who have learning and attention issues. The website conducts daily webinars and chats in Spanish and English on critical topics for parents. It is a great resource for parents and the link to their main page. This post is sharing the live Spanish chat I conducted for Understood.org on the How Reading in Spanish can help English. Here is the link ¿Cómo leer en español ayuda a los niños con el inglés? 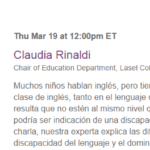 This post is sharing the live Spanish chat I conducted for Understood.org on the special education process for parents and how to know whether a bilingual child is having difficulties in schools due to the English language learning process or because of a potential disability in both languages. The chat is in Spanish and parents can access it at any time. Click here to access the recorded live chat. Below is the link to the latest one I did on helping parents know the difference between typical English language development and a potential disability. The chat is in Spanish and it is focused for parents.